« Pre-op cardiac risk assessment : No worries . . . Dr.Hippocrates is on call ! Pressure recovery phenomenon : A brief attempt to understand it ! Please note , the pressure should drop both above and below the aircraft by Bernoulli principle .But, the engine and wings are arranged in such a way , the air speed below the aircraft is slower and hence the pressure is high below and low above and the lift occurs promptly at take of velocity. 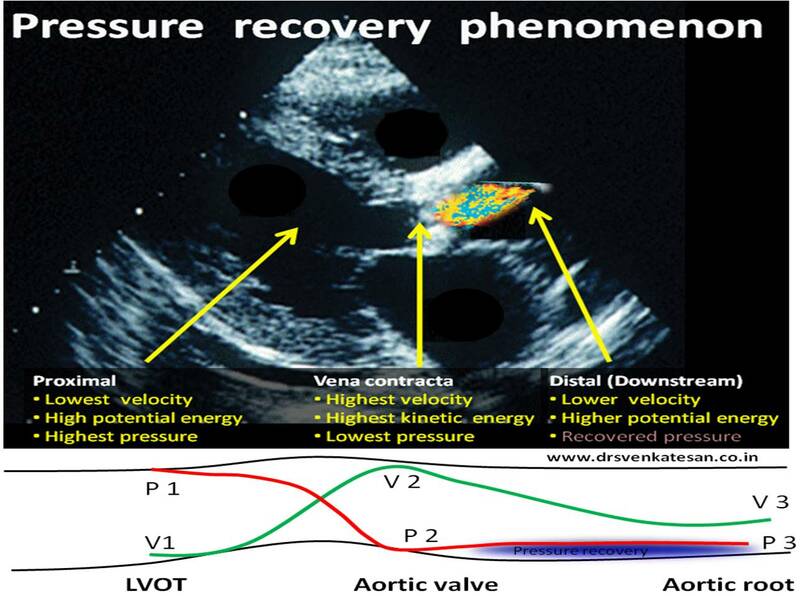 Imagine , how the valve leaflets in heart is subjected to lift and drag forces every time the blood gushes with high velocity flows.This is also the reason for the Pulsus bisferiens, SAM in HOCM, Coanda effect in supra valvular stenosis, and any post stenotic dilatation. 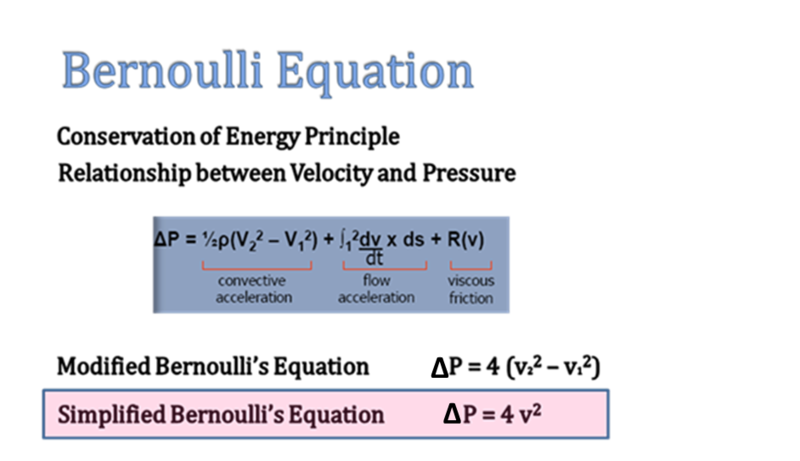 In Echocardiography the Bernoulli equation is modified. In clinical doppler echocardiography, we have liberally simplified the original Bernoulli equation by ignoring the the proximal sub valvular velocity V1 . Further , two more components in the equation is also amputated for our convenience ! (Flow acceleration and the viscous friction) .This is the reason we tend to err many times especially in outflow tract gradients and prosthetic valve gradients . This is another hemodynamic lacunae in clinical echocardiography. We know, thepeak velocity of blood is attained just distal to site of obstruction. As the distal velocity beyond the obstruction begins to fall, the pressure tends to recover corresponding to the loss of velocity. This happens to certain distance beyond the obstruction. Since continuous wave doppler measures the pressure in its entire axis of alignment , it is likely to pick more pressure samples from the recovered areas and net result is, it measures more than the true difference in gradient across the valve.The phenomenon is most relevant in assessment of Aortic stenosis and results in over estimation of severity of stenosis. How much can be the overestimation ? It can be up to 30 % or even more.Especially in prosthetic Aortic valves. How to recognise it and overcome it ? First of all, recognise such a hemodynamic phenomenon exists and the sacred 4v square can be a myth ! Never go with gradient alone in diagnosing valve stenosis. Look for 2D features also.This is more vital when you suspect acute valve obstruction. Always add the proximal sub valvular velocity (V1 ) in your Bernoulli equation .It need to be subtracted. The effect of heart rate on pressure recovery has not been properly studied. (The impact of which could be vital and hence too many false prosthetic emergencies could be avoided, as cardiologists tend to rely mostly on gradient than anatomical diagnosis of valve obstruction like visualising thrombus or struck leaflet by TEE or fluro. Yes, It does happen in cath lab also , as its related to physics of flow. It can be minimised if we can use two simultaneous catheters ,one in LV and the other Aortic catheter placed very close to the leaflets.